This Sunday, September 30, we will celebrate the last and greatest day of the Feast of Sukkot (Tabernacles). 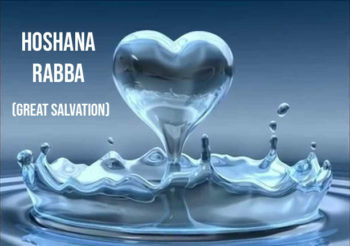 Called Hoshana Rabba (Great Salvation), it is the day on which Yeshua revealed publicly that He is Messiah. The day carries prophetic and messianic significance which the Jews of Yeshua’s time understood. Today, followers of Yeshua who are not Jewish deserve to understand that significance, too. But this water libation ceremony was not only about physical rain. It was also a type of prophetic intercession for spiritual rain associated with the coming of Messiah. The petitionary act was based on the Hebrew Scriptures which speak of life giving waters poured out in the Messianic Age. The Jews celebrating Sukkot in Yeshua’s day were aware of these prophetic Scriptures and viewed the Hoshana Rabba ritual as a symbolic prayer for Messiah. Many other rabbinic traditions are associated with Hoshana Rabba. These traditions are of varying degrees of consistency with the Scriptures, so please prayerfully discern the extent—if any—to which you might embrace them. One tradition, for example, teaches the last day of Sukkot represents the final day of divine judgment in which the fate of the new year is determined. Hoshana Rabba is treated as a mini Yom Kippur in which God may give special mercy.This is because the gates of heaven are said to open on the last day of Sukkot in order to dispatch the verdict issued on Yom Teruah and sealed on Yom Kippur. When those gates are open, the rabbis believe there is open access to God. A related belief is that God determines on this day how much rain each nation will receive in the coming year. Tradition does not require fasting on Hoshana Rabba as a mini Yom Kippur, but mandates other rituals. These include, for example, circling Torah scrolls seven times while plaintively crying out for forgiveness, beating lulav willows until all their leaves fall out to signify the shedding of sin, and the reciting of certain prayers.